The responsibility for producing safe and competent health care professionals rests with educators who periodically evaluate and modify curricula to meet program outcomes (Atcherson, Zraick & Hadden, 2017; Coleman, Peterson-Perry, & Bumsted, 2016; Kennard, 2016; Mosley & Taylor, 2017; Toronto & Weatherford, 2015). The association between client safety and effective communication is increasingly recognized in research (Wolf & Bailey, 2009). 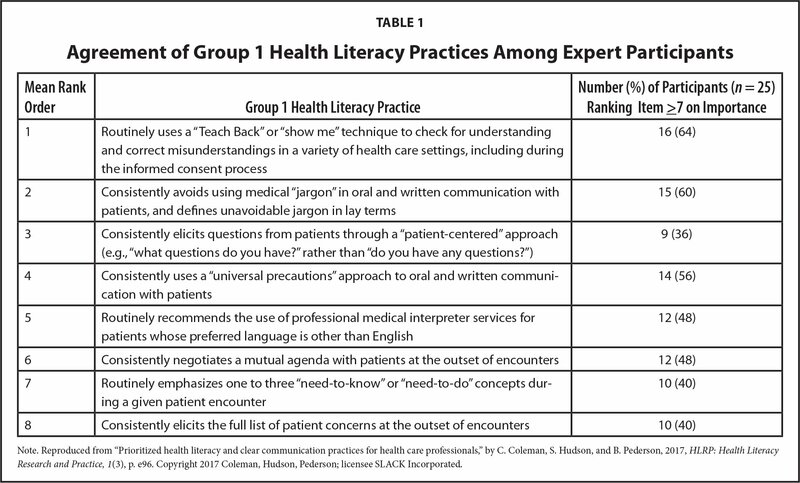 Communication strategies used to help clients understand and follow health teachings are fundamental to health literacy (HL) education (Agency for Healthcare Research and Quality, 2017). Recently, more health professions educators are integrating necessary HL concepts and evaluating the effectiveness of curricular efforts (Massey et al., 2017). Despite increasing integration of HL concepts into the curricula, teaching strategies and evaluation efforts vary greatly, in part due to the heterogeneity encompassed by the term “health professions education.” In the United States, the education continuum spans from the undergraduate (2-year and 4-year college degrees and pre-professional education; Campus Explorer, 2018) to the postgraduate or professional degrees of medicine, pharmacy, dentistry, and others. Because we teach in a 4-year nursing program, we use the term “undergraduate” to describe students who have not yet completed their baccalaureate degrees. We realized that our nursing curriculum only tangentially addresses HL via education on best communication strategies, cultural influences on client education, and ways to determine how clients understand discharge teaching. Our desire to integrate HL concepts throughout our undergraduate program informed our search for, and perspective on, a core HL curriculum to adopt. Because there are no guidelines or standards for teaching students about health literacy, nursing programs must decide for themselves what content to cover, how to evaluate student learning, and the number of hours devoted to the topic of health literacy (p. 157). We contend that more standardization is needed to address this important client-safety issue. We direct this “call to action” to those teaching at the undergraduate level. We advocate for the adoption of a core HL curriculum and the standardization of evaluation criteria. These criteria can then guide educators in evaluating curricular strategies as evidenced by student achievement of target behaviors. A systematic review of HL education in the health professions (Saunders, Palesy, & Lewis, 2018) summarized the quality of 28 studies that reported evaluations of HL curricular implementation. Studies originated from Australia, Ireland, and the US. These authors reported that the majority of studies “targeted undergraduate students (86%, n = 24)” with 17% (n = 5) targeting nursing and nutrition/dietetic students. Saunders et al. (2018) concluded that the field of health professions education needed greater clarity regarding a core HL curriculum and high-impact teaching strategies. An integrative review of HL in the curriculum by Toronto and Weatherford (2015) usefully summarized published US studies, yet the authors did not separate the knowledge, skills, and attitudes expected of undergraduate students from those expected of postgraduate students. These authors determined that HL is being integrated into many health professions curricula but more research is needed to determine the most effective teaching approach. They concluded that the research on curricular strategy effectiveness is nascent, and future endeavors should focus on using reliable and valid assessment tools. Specific to undergraduate nursing HL education, McCleary-Jones (2016) reviewed original research on nursing student HL knowledge and the impact of HL curricular inclusion. McCleary-Jones (2016) wrote that her review “revealed limited and inconsistent health literacy content in nursing curricula” (p. 96). After reviewing the literature, we concluded that no core HL curriculum exists for the undergraduate-nursing level. Also absent from the literature is a standardized set of evaluation criteria for use with undergraduate HL education. The given state of HL undergraduate education led us to examine the work done by postgraduate health professions educators. The ongoing work conducted by Coleman, Hudson, and Maine (2013) and Coleman, Hudson, and Peterson (2017) exemplifies a methodological approach to the topic of HL curricular design and evaluation at the postgraduate and continuing-education level. Coleman et al. (2013) published a consensus list of HL practices and educational competencies useful to all health professions educators. They convened an expert panel and charged the panel with ranking 62 HL competency and 32 practice items. One potential limitation to the adoption of this list for undergraduate education is the composition of professionals participating on the expert panel. The authors never specified how many on that panel taught at the undergraduate level. Coleman et al. (2013) concluded that, because most of the available literature focuses specifically on professions in the field of medicine, “more work is needed from other disciplines in health care” (pp. 98–99). Coleman et al. (2017) further developed their ranking of the 32 practices by prioritizing them using a consensus Q-sort method. Their study resulted in eight top-priority practices. As their eight priority practices (Table 1) were intended for all health care professionals, we believe their list provides a framework for undergraduate curricular design and evaluation. We advocate that health professions educators use the eight priority practices developed by Coleman et al. (2017) as the core HL curriculum for undergraduates. Adopting this discrete list of HL practices allows educators to concentrate on the work of integrating the target behaviors into the curriculum and developing evaluation tools. The other 24 practices as prioritized by Coleman et al. (2017) may be selected depending on the specific health professions discipline and client situation. Coleman et al. (2013) suggested health professions educators focus their HL teaching on the areas most pertinent to their discipline. For example, nurses new to their discipline would be expected to use a “universal precautions” approach when orally communicating (Table 1; mean rank order 4) but not expected to write discharge instructions at a 5th grade level (mean rank order 28; Coleman et al., 2017). Just as this example is specific to nursing, each discipline should identify and prioritize those other practices mentioned in the publication by Coleman et al. (2017). Once these practices by Coleman et al. (2017) are adopted as core HL curriculum, we advocate standardizing how best to measure student achievement. In education, verbs such as uses, avoids, elicits, and recommends require a predetermined threshold when measured. For example, in the fourth mean-rank-ordered practice (Table 1), the phrase “consistently uses” might indicate a behavior observed in anywhere from 51% to 100% of encounters. If the threshold or level of proficiency is not specified, an educator cannot objectively and accurately evaluate the student's skill. Additionally, standardization allows for reliable and valid research comparisons “of the impact of health literacy training” (Saunders et al., 2018, p.15). In closing, it is our perspective that using prioritization of HL practices by Coleman et al. (2017) gives undergraduate educators a core HL curriculum. If educators adopt these eight priority practices as the curricular student-learning outcomes, they can then develop teaching approaches, determine reliable evaluation of student achievement, and finally standardize the evaluation of HL target behaviors. Educators new to the role of HL curricular design may find the prioritization work by Coleman et al. (2017) supportive as they seek administrative help to integrate HL in their undergraduate health professions curriculum. Coleman, C. A., Peterson-Perry, S. & Bumsted, T. (2016). Long-term effects of a health literacy curriculum for medical students. Family Medicine, 48(1), 49–53. Karen Hernes, MS, RN, CNE, is an Assistant Professor. Vivian Ott, PhD, RN, NE-BC, is an Assistant Professor. Both authors are affiliated with the College of Nursing, Purdue University Northwest. Address correspondence to Vivian Ott, PhD, RN, NE-BC, College of Nursing, Purdue University Northwest, T-374, 1401 S. U.S. Highway 421, Westville, IN 46391; email: vott@pnw.edu.